An affecting, wide-ranging evocation of a turbulent decade when the civil-rights movement launched its fiercely determined, largely nonviolent battle for America's social conscience and soul. A sometime magazine writer/editor with one novel (The Empire Blues, 1981) and a ghosted sports bio to his credit, Branch provides introductory perspectives on the Deep South's black churches--where the cause of desegregation was nurtured to the accompaniment of animating anthems, prayers, and sermons. In this first volume of a two-part work, though, he focuses on the period that began with Martin Luther King's 1954 arrival as pastor of Montgomery's upscale Dexter Avenue Baptist Church and ended with the 1963 assassination of JFK. 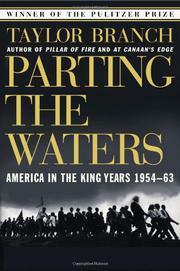 In what he styles a narrative biographical history, the author recalls the economic boycotts, demonstrations, jailings, financial woes, judicial decisions, political maneuverings, internal dissensions, and vicious reactions that marked the early stages of blacks' first organized efforts to achieve equal rights in the face of entrenched racism. Cutting back and forth between the distinctly different worlds of black and white leaders, Branch provides warts-and-all portraits of those who played key roles in the long-running drama. King claims the heart of this account. But the author also profiles Ralph Abernathy, Harry Belafonte, J. Edgar Hoover, JFK and his brother Robert, Stanley Levinson, John Lewis, Robert Moses, George Wallace, and a host of other principals. Covered as well are less celebrated participants--including the estimable Septima Clark, who once reminded Andrew Young that it might be wise to share the lot of the hungry volunteers he recruited and bused about for confrontations with recalcitrant municipal authorities. Nor does Branch shrink from harsh judgments. At the close, for instance, he reports without disputing King's belief that Kennedy's death was a blessing for the civil-rights campaign, which might otherwise have stalled. In brief, then, a vivid, panoramic text that documents in telling detail the roots of an epic, many-splendored cause.